Australia, the place where everyone’s your mate, and you are everyone’s mate. And everybody says g’day, mate. At least, that’s what I heard. Does everyone really say G’day mate in Australia? No. Does everyone really call you mate in Australia? Pretty much. When I think Australia, I think Kangaroos, and if you go to FeatherdaleWildlife Park and the last thing you do in Australia is feed super cute kangaroos and wallabies, I think you would too. But I also think of spiders, because we saw more than a couple life-threatening spiders in the houses that we stayed at, and though it was a little creepy (waking up, going to brush your teeth and finding a whitetail in the bathroom), it was fun and interesting. When you find a huntsman spider in your living room, you can’t help but feel interested, and you can’t help but wonder whether to bring it outside, or squish it and take the chance that hundreds of little babies might come out of it’s abdomen. Of course, you could just use the vacuum, which we tried as well, and that didn’t go as planned. In the end, we just decided to squish it and take our chances. Thankfully, it worked. There are lot’s of waterfalls in Australia, and even one you can climb: It’s very beautiful and is part of a park called Scenic World, which has a number of other things like going across the sky in the skyway, and taking a very steep little train down the cliff. It’s very beautiful and you can see the three sisters, a rock formation that used to be the seven sisters. Australia is a very great place to be, despite the spiders, as there are tons of cool mountains, waterfalls, and hiking trails. 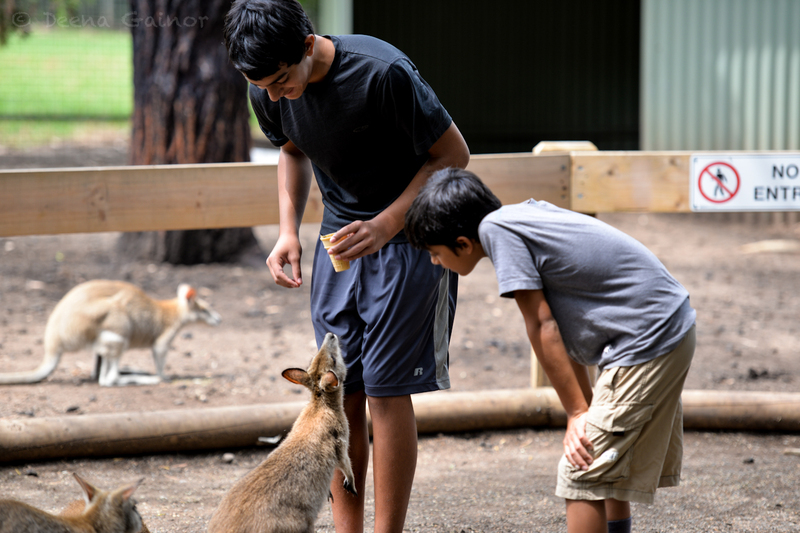 It’s a great place to explore nature and have fun feeding the wallabies.